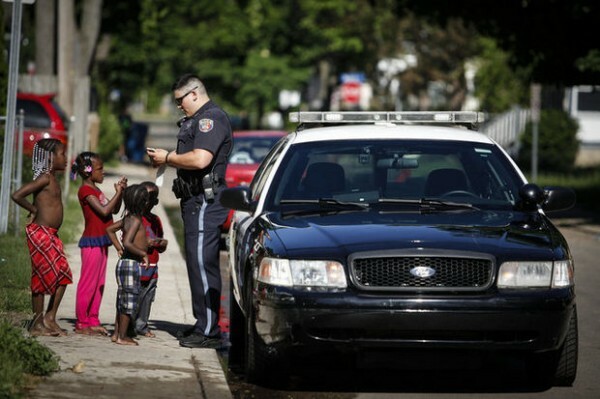 KALAMAZOO, Michigan – In September 2013, police officers in Kalamazoo were forced to face an ugly reality: concrete data that they were racially profiling residents. The yearlong study by Lamberth Consulting, which specializes in racial profiling assessments, examined police stops at 12 different locations in the city of 75,000 starting in March 2012, and found that black motorists were more than twice as likely to be stopped as white drivers. And even though whites were more likely to be found with contraband like guns and drugs, far more blacks were searched, handcuffed and arrested. Public Safety Chief Jeff Hadley, who commissioned the study, said the results shocked the entire force. “It kind of takes your breath away,” he said. “But what do you do? Do you sit there and act like a deer in headlights? Do you dismiss the study that you asked for?” Hadley didn’t do either of those things. Instead, the chief used the data to try and right a decades-old wrong. Before the deaths of Mike Brown, Eric Garner and Tamir Rice at the hands of white officers sparked feverish debate about police abuse and racial targeting, Kalamazoo began to confront bias in its force. For many who’d vowed to protect and serve this small city, the stark numbers were difficult to swallow. Growing up in the city, Pinney-Johnson says getting stopped by police was par for the course. He never trusted the police and always felt that officers were there primarily to harass him, not to protect him. At first, many Kalamazoo police officers reacted to the study by cutting back their traffic stops dramatically. In the month after the study became public, stops fell off a cliff, dropping by 45 percent. According to Chief Hadley, it’s only natural that officers faced with the report’s conclusion would get more skittish making stops. But his hope was to reform the force in a deeper way. His first move was to consult leaders in Kalamazoo’s African-American community, like Walker. A retired sociology professor, Walker felt that much of the problem was rooted in implicit bias – beliefs that operate outside your conscious awareness. The need for police departments to confront this fact has gained popularity in the last year, alongside the groundswell of activism around racialized police-involved violence. Hadley made racial bias training mandatory for Kalamazoo officers and also ordered that they document probable cause for every suspect they search. He also set up quotas for interactions with the public meant to build better relations with the community. The frustrating thing about the article (in tab 1) is the reaction of the officers when they learned the results of the study. They said they were shocked to learn they were racially profiling, but if that’s genuine shock then that means they believed every black person who’s been telling them this for decades were all liars. I’m not sure which one is more troubling. Them knowingly using race to determine who they stop and letting race influence how they treat the people they stop, or them (police) being totally clueless to their own implicit bias when it comes to stopping motorist, but discounting information coming from black people because they seem to be less trustworthy. Both are horrible and equally depressing. I know this particular police department deserves a lot credit for trying to change things, but still my frustration remains.